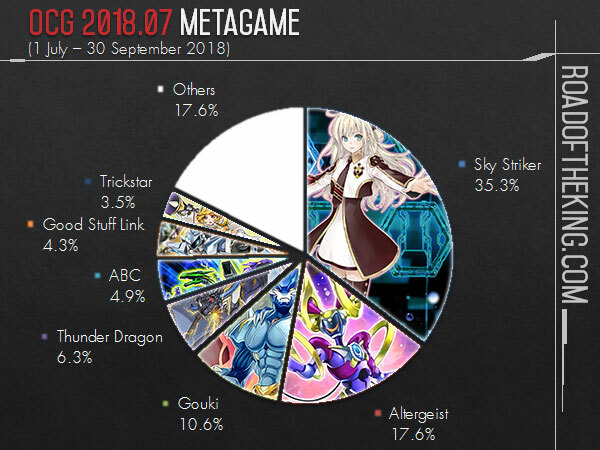 The OCG 2018.07 Limit Regulation took out Magician, leaving Sky Striker to reign supreme. The debut of Thunder Dragon shook up the competitive scene initially, but they were only able to make a momentary impact. This followed by the rise of Altergeist and then Knightmare Link, with Gouki and Good Stuff Link leading the charge. Compiled from a total of 490 top-placing decks from 74 competitive tournaments held in Japan, China and Asia, here is the final metagame breakdown of the OCG 2018.07 format. Sky Striker took a commanding lead at the start of the format, until the debut of Thunder Dragon in Soul Fusion. Thunder Dragon left a small dent in Sky Striker’s dominance, by using Thunder Dragon Colossus to heavily disrupt Sky Striker’s primary strategy of amassing card advantage through Sky Striker Mobilize – Engage! and Sky Striker Ace – Shizuku. However Sky Striker was able to adapt by switching Effect Veiler to Infinite Impermanence for negating Thunder Dragon Colossus, and running Ghost Belle & Haunted Mansion in the Main Deck. Although Sky Striker managed to maintain the lead till the end, the gap between them and Altergeist have narrowed considerably in the middle of the format. Sky Striker’s consistency takes a minor hit, but they remain as the top contender going into the OCG 2018.10 format. The debut of Thunder Dragon saw the rise of Altergeist. The overwhelming effect of Thunder Dragon Colossus kept many rogue decks in check, streamlining the competitive scene into Sky Striker and Thunder Dragon. This enabled Altergeist to take a very drastic approach of deck building by running Secret Village of the Spellcasters in the Main Deck to shutdown Sky Striker. Altergeist naturally has a good matchup against Thunder Dragon as both Altergeist Meluseek and Altergeist Silquitous are easy answer to Thunder Dragon Colossus and Thunder Dragon Titan. Altergeist continued in a close second place behind Sky Striker for the rest of the format. 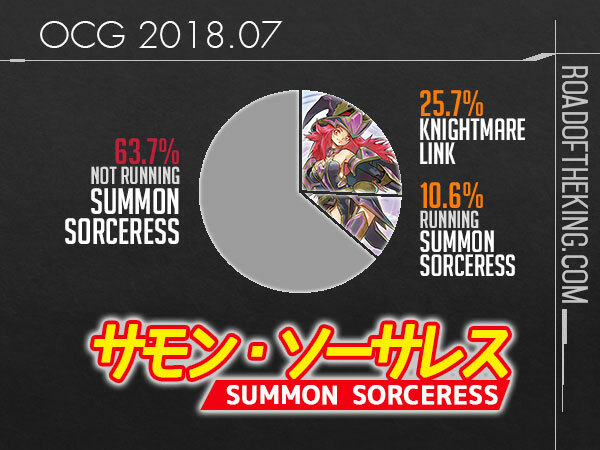 Altergeist took a single hit to its consistency, but due to the diverse metagame in the early OCG 2018.10 format, they will have to adopt a more all-round approach in deck building and leave Secret Village of the Spellcasters in the Side Deck. The decline of Thunder Dragon saw the rise of Knightmare Link decks, and among them, Gouki has the strongest performance. Gouki has 2 main strategies – both involves setting up an Extra Link using various Knightmare monsters, but one ends with Borrelsword Dragon and giving the opponent Knightmare Corruptor Iblee, while the other one discards the opponent’s hand using Topologic Gumblar Dragon. This is essentially game if the opponent is unable to disrupt the combo as they would find themselves overwhelmed by a board of Knightmare Link Monsters. Gouki took a heavy hit in the OCG 2018.10 Limit Regulation, but they are not quite out of the competitive scene yet. Other than the traditional Armageddon Knight and Destiny HERO – Malicious build, some players are trying out a Mathematician and Dandylion build that is quite similar to Good Stuff Link. It is likely that Gouki would continue to evolve with the release of Neo Space Connector in the upcoming Savage Strike. When all the Knightmare Link decks (Gouki, Good Stuff Link, ABC, SPYRAL, etc) are tallied together, they amount to a total of 126 out of 490 decks. At 25.7%, this surpassed even Altergeist at 17.6%. The Knightmare Link decks have a similar setup of using either Isolde, Two Tales of the Noble Knights or Crystron Needlefiber to Link Summon into Summon Sorceress and then into Firewall Dragon. Interestingly, Summon Sorceress being the middleman took the hit, and that indirectly affected a few other decks. 52 out of 490 decks like Thunder Dragon and Cyber Dragon, uses Summon Sorceress to extend their plays, though they are not the core essential combos. The remaining 312 decks do not run Summon Sorceress. If you enjoyed these Quarterly Metagame Reports, do consider supporting Road of the King on Patreon. Thank you. How do you subscribe to the blog to get Email notifications? Do you have any idea what the sole Lightsworn deck was composed of?